Today if you walk into any trendy ladies' clothing store, you'll notice one thing: everything is so...tight. Bodycon dresses are made from a bled of spandex so they have a very snug fit. Skinny-fit jeggings are cute but not exactly comfortable and don't even get us started on form-fitting bodysuits! We long for the day where it was perfectly acceptable to hit the club in a breezy windbreaker tracksuit. Always featuring a rather adventurous color palette, tracksuits were both flashy and cozy plus they made an addicting swoosh sound with every slight move you made. People didn't know whether you were just getting done with a jazzercise class or heading to a Tina Turner concert when sporting a tracksuit, and that is a beautiful thing! Unfortunately, we can't send you back in time to the totally rockin' 1980's, but we can hook you up with a retro ensemble. 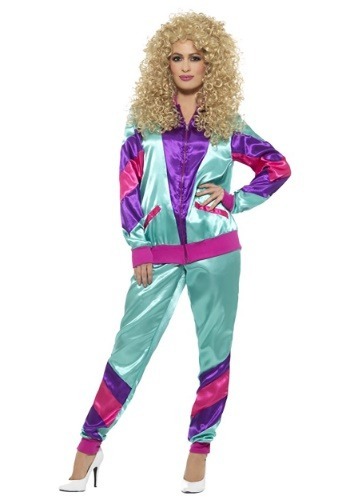 Now you can be personally responsible for bringing back the classic windbreaker trend by wearing this ladies 80's tracksuit costume. Zip up the shiny jacket featuring pockets and a pastel color scheme and finish off the look by jumping into the coordinating pants which cinch around the ankles. Now you're ready to grab your Walkman and jog on down to the local arcade for a game of Pac-Man! Don't forget to tie a neon scrunchie in your hair to complete the look. We have a feeling that once you're seen out and about in this rad tracksuit, the once-popular fad will make a sudden comeback.